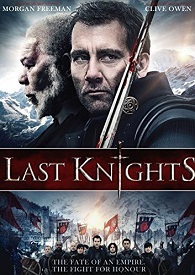 Clive Owen and Morgan Freeman star in this medieval action feature directed by Kazuaki Kiriya. After being appointed commander of his kingdom's knights, skilled warrior Raiden (Owen) is forced to seek justice for his noble master Bartok (Freeman) who refuses to bow to pressure from the corrupt lords of the realm. With Bartok's house destroyed and his loyal men dispersed it is up to Raiden to avenge his master's persecution by going after the influential and power-hungry minister Gezza Mott (Aksel Hennie). Can you name the two featured actors in The Last Knights?